Boeing’s KC-46A Pegasus tanker program has completed its planned Phase II receiver certification flight testing following three weeks of flights with F-15E Strike Eagle aircraft out of Edwards Air Force Base, California. Boeing and U.S. Air Force KC-46A Pegasus crews kicked off receiver certification testing with F-16 Fighting Falcon aircraft in April 2018. Since then the joint team also completed testing with KC-135 Stratotanker, C-17 Globemaster III, A-10 Thunderbolt II, KC-46A Pegasus, B-52 Stratofortress, and F/A-18 Super Hornet aircraft. «This accomplishment is a tribute to the Boeing/U.S. Air Force team and helps set the stage for the start of Initial Operational Test & Evaluation testing next year», said Mike Gibbons, Boeing KC-46A Pegasus tanker vice president and program manager. «We are seeing great progress in both test and production and expect the positive momentum to continue as we begin delivering aircraft». 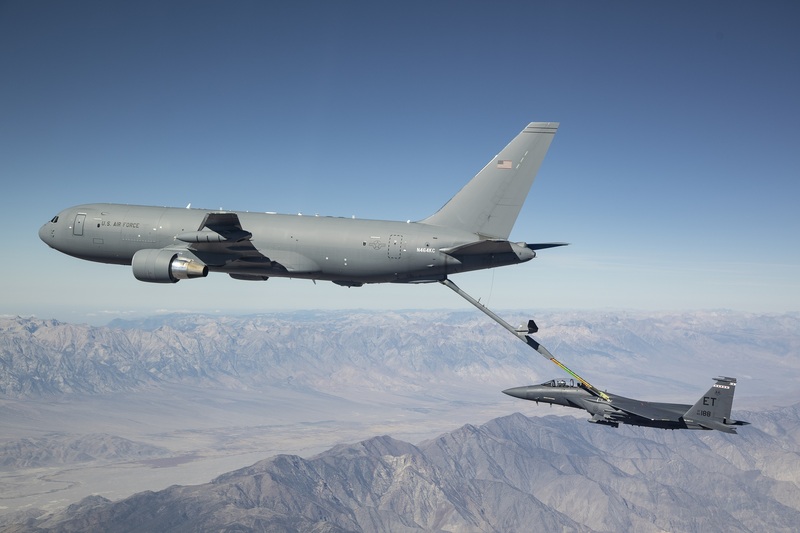 During the certification flight tests, KC-46A Pegasus and receiver aircraft flew at different airspeeds, altitudes and configurations to ensure compatibility and performance throughout the refueling envelope of each receiver. Now, the Air Force and the Aerial Refueling Certification Agency will review all test data and paperwork before ultimately “certifying” each aircraft. «The Air Force crews were with us every step of the way during this critical testing», said Jake Kwasnik, KC-46A Pegasus test program manager. «It was awesome to see everyone working together as we conducted flights out of Boeing Field and also at Edwards and Minot Air Force bases». The KC-46A Pegasus, derived from Boeing’s commercial 767 airframe, is built in the company’s Everett, Wash., facility. Boeing is currently on contract for the first 52 of an expected 179 tankers for the U.S. Air Force.